Thriller: chasing down The Eagles. It's no secret that Michael Jackson's death has led to a huge surge in sales of his music, and it now seems that this will take his Thriller album to the top of the 'all-time best sellers' list in the United States. Billboard reports that in March, prior to Jackson's death, Thriller was certified as 28 times platinum and The Eagles' Greatest Hits collection 29 times (which means that the albums had sold at least 28 million and 29 million copies respectively). 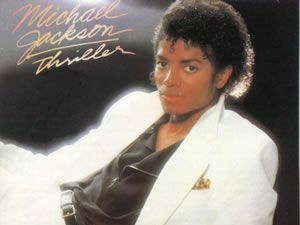 However, it's being estimated that shipments of Thriller may now have exceeded 29 million and that, one these have been sold, they'll give Jackson's 1982 record the edge. In other Jackson-related news, it's being speculated that AEG Live, the promoter of The King Of Pop's London O2 residency that was planned for this summer, is now hoping to give a cinema release to a documentary of the star's final weeks. It seems likely that this will feature footage of his rehearsals for the shows.